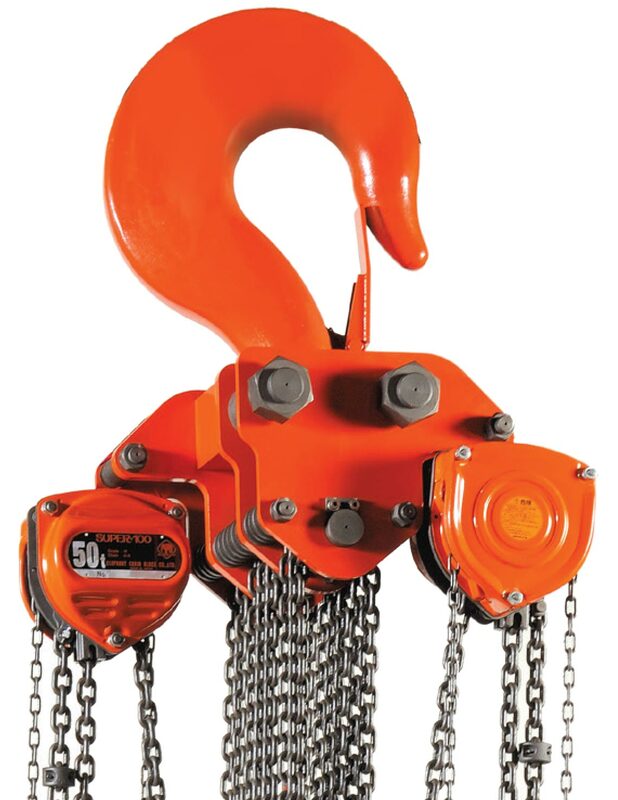 Ideal for oil and gas rigs. Double pawls supporting fail-safe brake mechanism - Even if by any chance one of the two pawls becomes unserviceable, the other will still remain operative, and the brake system remains secure. 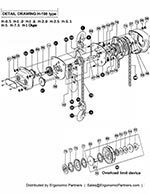 Bottom hook with thrust bearing - The thrust bearing enables the lifted load to be moved in any direction without subjecting it to stress. 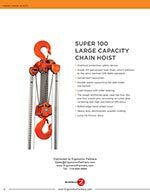 Hooks of easier handling shape - The opening of the hooks has been made wider for easier handling and working. 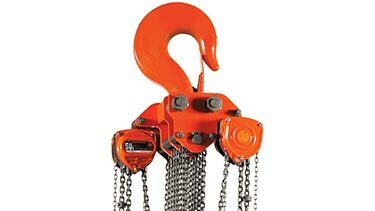 However if by any chance the hook is overloaded there is no fear of it breaking, it will gradually start straightening out, avoiding any load drop or personal injury. Tough framing - The tough gear case, reinforced with four ribs and four knock pins, provides accurate gear centering and high mechanical efficiency. 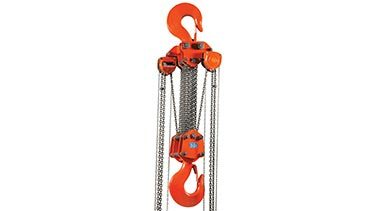 Rolled-edge hand wheel cover provides smooth operation of the hand chain when pulled sideways. Strong and least-corrosive electrostatic powder painting. Dry friction discs with longer life. 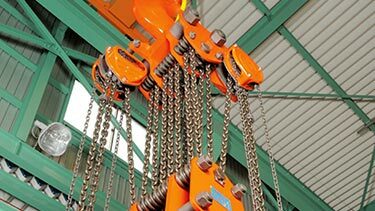 Load sheave with roller bearing. 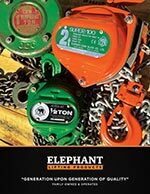 Elephant's high-tech load chains are approved by DIN 5684, one of the world's strictest standards. 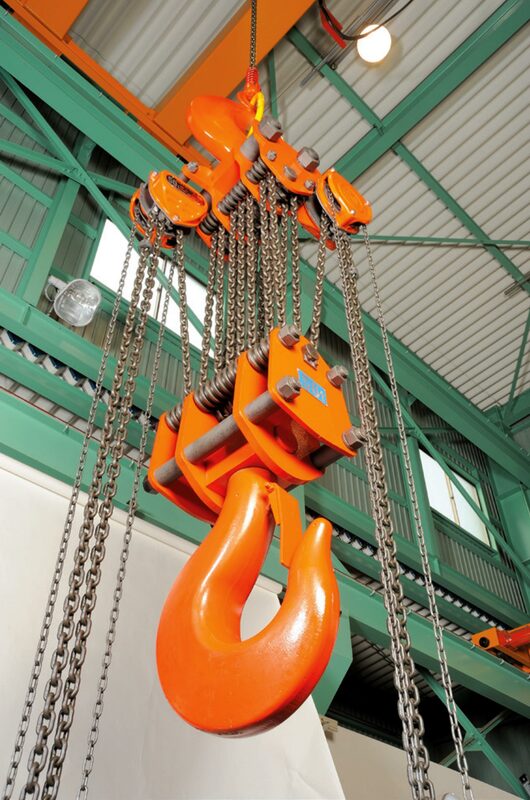 This is the special heat treated load chain of ISO grade +V (105kg/mm2), whose tensile strength far surpasses ISO V class. H100-16 38.78 in. 9.25 in. 19.37 in. 3.19 in. H100-20 44.09 in. 14.21 in. 28.39 in. 3.23 in. H100-32 50.79 in. 15.79 in. 28.39 in. 4.09 in. H100-40 57.09 in. 19.41 in. 28.78 in. 4.25 in. H100-50 59.84 in. 21.3 in. 28.78 in. 4.72 in. 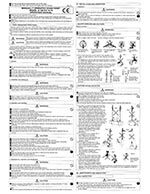 H100-80 126.0 in. 28.7 in. 55.10 in. 7.0 in. 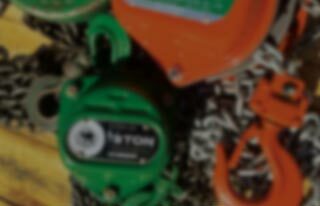 Ergonomic Partners is a distributor for ATEX certified spark resistant hoists; serving clients from coast to coast, Canada, Mexico and especially focused in the states of Missouri, Illinois, Indiana, Kansas, Arkansas, Mississippi, Nebraska, Tennessee, Kentucky, Iowa, and Oklahoma.